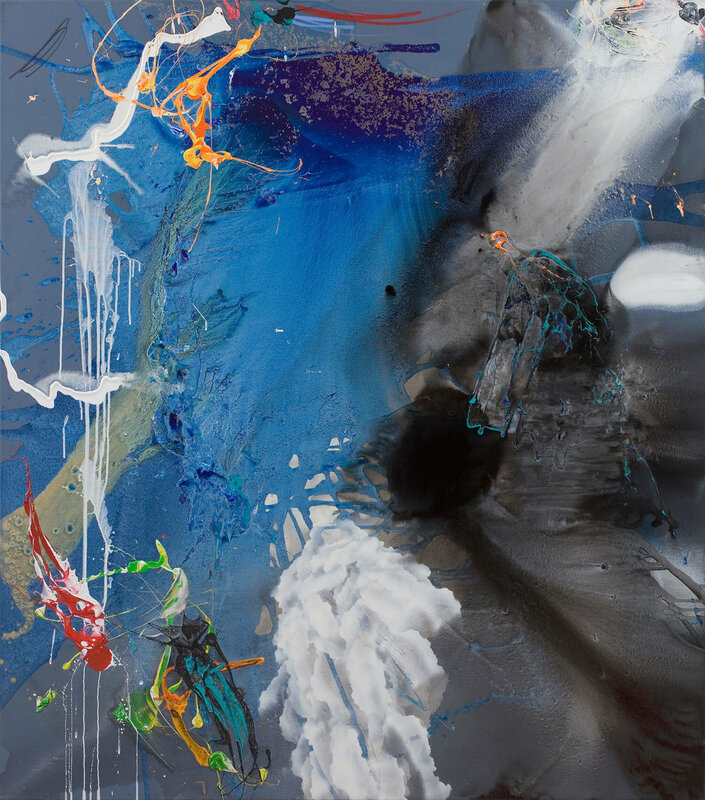 Stewart’s work is abundantly rich and painterly; pigment is splashed, drawn and poured, causing the viewer to feel the artist’s physical presence in the work. 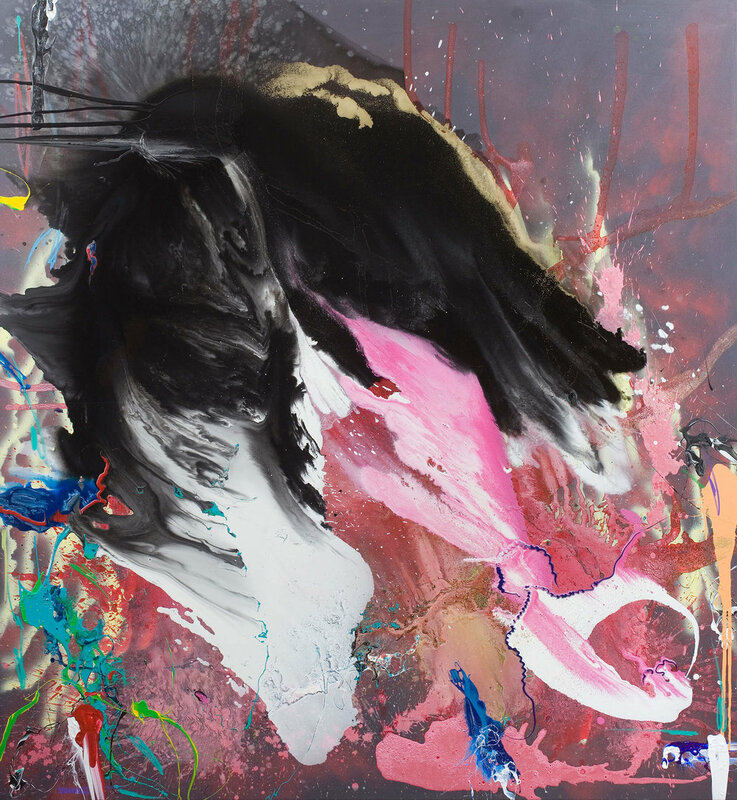 His is an involved process of layering rhythmic movement, enriched through the physicality of the materials he uses such as gloss paint, glitter and diamond dust. Ultimately, it is the variety of medium that creates tactile surfaces, which spill out and envelop the viewer in a journey through spectacular, meditative visual landscapes. Stewart has had numerous shows in London and has exhibited internationally, including a recent solo exhibition at Sarah Myerscough Gallery in 2013. He was part of the ‘Celebrating Mozart’ exhibition that took his work to Havana, Seoul, Bogota and Caracas as well as the House of Parliament, Vienna, Houses of Parliament, London and at the Salzburg Festival at the Television Centre, Austria. Another touring group exhibition has taken his work to the European Parliament, Brussels. Stewart is included in many public and corporate collections around the world; Egon Zehnder International; Hammerson; Colliers CRE in London, Glasgow and Manchester; the Town Museum, Hall and Landes Museum, Tyrol, both in Austria; and private collections in London, Germany, Switzerland, Australia, Italy, Austria, USA and France, including that of the Duke and Duchess of Westminster and Franz Fischler, The ex-Agricultural Minister for European Union (collaborative work). Stewart will be exhibiting in May 2015 in the church of the Wiener Zentralfriedhof in Vienna. Furthermore, Stewart has been recently commissioned a large site-specific work for the atrium of an exclusive residential building in Vienna’s Museum Quarter. The work consists of several hanging pieces on aluminium to be unveiled in September 2015. Both projects are in collaboration with Viennese artists Ernst and Eleonor Friedrich. Sarah Myerscough Gallery is participating for the third consecutive year in the Parisian fair, where it will present works by gallery artists as well as exciting new digital interactivepieces by Dominic Harris and Cinimod Studio. The gallery will be participating again in the London Art Fair with new works by the artists: Maisie Broadhead, Alicia Dubnyckyj, Nicholas Jolly, James Lumsden, Andrew Mackenzie, Emily Moore, Jenny Pockley, Paul Riley, Andy Stewart and Wycliffe Stutchberry. The art fair will take place from the 21-25 January 2015 at the Business Centre on Upper Street, Islington, London. Andy Stewart - Truth. Time. Matter. Haunting, evocative and fizzing with hedonism, Andy Stewart’s remarkable new exhibition ‘Time. Truth. Matter’, takes the visitor on a stroll, with Stewart as his amiable guide, to the frontier where the spirituality of man encounters the vast, fearful magnificence of the universe and the laws which govern it.